Okay, so let’s start off with the cover this time round, mainly because it caught my attention out of all the other books on the PanMacmillan website, but the book was amazing. It was, immense, intense and EPIC. It had me flipping pages all night just to see what happens, and boy this book blew me away, knocked me off my feet, gripped me in the gut... okay, I’ll stop now. But what I’m trying to say is... 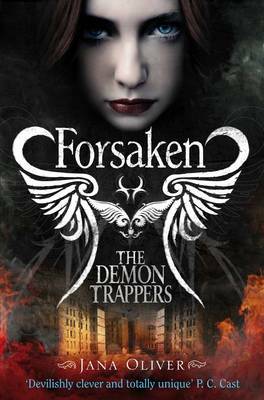 HURRY UP AND RELEASE FORBIDDEN BECUASE FORSAKEN WAS BLOODY AMAZING!!! The book is nice and fast paced, and it kept me reading. The story is like a jigsaw, it leaves you confused and then chapters later it all slots together, and following on that not, I have to say the book was beautifully written. The style was very edgy but unique and I really enjoyed reading it. My favourite character was either Beck or Simon. Beck is those guy who acts all tough and strong and ‘pah, you’re a twonk’ attitude character but really he’s insecure and finds it hard to express his emotions, shown when he turns Riley down and gets jealous when she and Simon start a relationship. Simon now, is this perfect angelic boy with Heaven on his side. He has a really nice and caring personality and is just... AWESOME. I suppose I just want to read FROBIDDEN and FORGIVEN and out of five stars, I’ll give it... six!!! Jana Oliver has created and immense, awesome, cool, Novel. Wow! What a lovely review! Thanks so much. I'm so glad you enjoyed the book. I will warn you that Simon doesn't cope with his injuries very well in FORBIDDEN. And there are more twists and turns. I hope you enjoy them. Thanks again!! @ Jana Oliver - Thanks!!! Can not wait. Thanks for the update. Should be getting a proof soon!!! !